1. Paul Dean was born in Lucas, Arkansas in August 1913. His parents were sharecroppers. 2. His older brother, Jay, and he were both excellent pitchers for their local team and caught the attention of scouts. 3. By 1932 he’d become a professional, playing for the Houston team of the Texas League. 4. 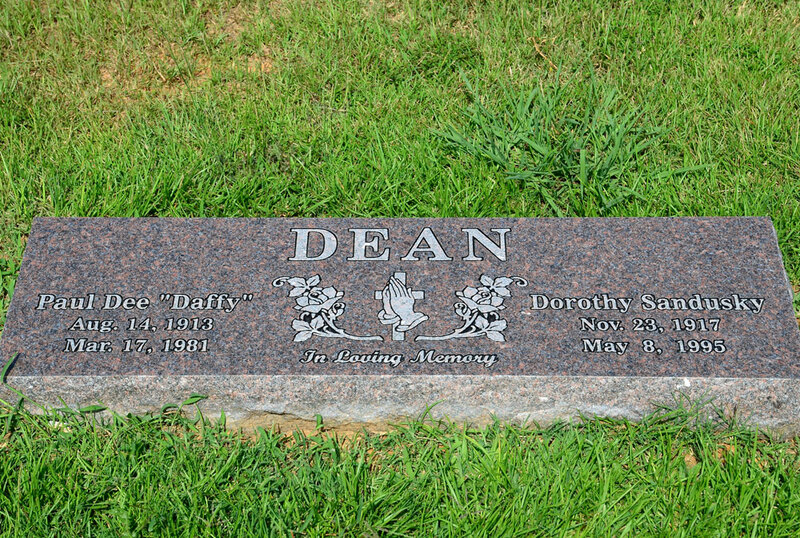 In 1934 he joined his older brother, now universally known as “Dizzy” Dean, as a pitcher for the St. Louis Cardinals. 5. Known as “Daffy,” a nickname he hated, he joined his brother to win 49 games, still a record for siblings on one team, in 1934. 6. In September 1934 he threw a no-hitter against the Brooklyn Dodgers. He allowed one baserunner (a walk). 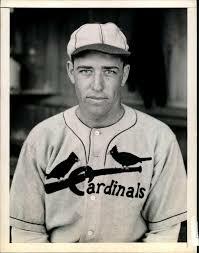 It was the only Cardinals no hitter thrown in the 1930s. 7. With St. Louis winning the National League pennant in 1934, he pitched games three and six of the World Series, winning both. After the Series he used his World Series share to buy a farm and pay for a Honeymoon. 8. He won 19 games again in 1935, then hurt his arm in 1936. The injury followed a long holdout and he claimed he was not yet in shape when the injury occurred. 9. He never recovered, going 7-6 for the rest of his career. He finished with the Cardinals in 1939, then spent two seasons with the New York Giants. During the Second World War he got into three games in 1943 with the St. Louis Browns. His final career record was 50-34 with an ERA of 3.38 and a BBREF WAR of 11.3 (10 of that earned in the 1934 and 1935 seasons). 10. After he left the Major Leagues, he managed in the minors and coached one year at the University of Plano, a school that closed in 1976. 11. He retired in 1965 and died in 1981, seven years after his more famous brother. 12. In the 1952 movie Pride of St. Louis he is played by actor Richard Crenna. With New York leading Brooklyn 3 games to 2 in the 1947 World Series, the last two games would be played on consecutive days in the Bronx. Brooklyn needed to win game six to force a game seven. The Yankees simply wanted to end it quickly. Game six became one of the more famous of all World Series games because of one substitute’s glove and one superstar’s reaction. Desperate to win, the Dodgers jumped on Yankees starter Allie Reynolds for two runs in the top of the first. Consecutive singles by the first three Brooklyn batters loaded the bases. A double play traded a run for two outs, but a Sherm Lollar passed ball plated the second run. The Dodgers sent Reynolds to the showers with two more runs in the third on three straight doubles. In the bottom of the third, New York finally got to Dodgers starter Vic Lombardi. A double and wild pitch sent Lollar to third. Then a ground ball error scored him. The Yankees then tied the score 4-4 on five consecutive singles, knocking Lombardi out of the game. New York went ahead in the fourth on singles by Aaron Robinson, Tommy Henrich, and Yogi Berra (playing right field rather than catching). The hitters took the fifth inning off before the critical sixth inning. A single and double in the Brooklyn top of the sixth sent Bruce Edwards to third. Cookie Lavagetto, pinch hitting for the third game in a row, lifted a sacrifice fly that scored Edwards. A double by pinch hitter Bobby Bragan plated a second run. With Dan Bankhead running for Bragan, Eddie Stanky singled, then a PeeWee Reese single drove in both runs. Consecutive outs ended the top of the sixth. To start the bottom of the sixth, the Dodgers made three major changes. Joe Hatten took over on the mound, Lavagetto went to third, and speedy outfielder Al Gionfriddo went to left for defense. With the score 8-5, New York’s Snuffy Stirnweiss worked a one out walk. One out later Berra singled sending Stirnweiss to second. Hall of Famer Joe DiMaggio stepped in and drove a ball to deepest left field. Gionfriddo raced back, leaped for the ball and caught it. 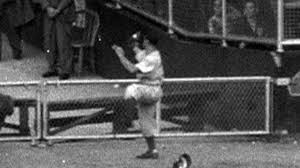 Initial reports indicated that Gionfriddo had robbed DiMaggio of a homer, but a frame by frame analysis of the film and a look at photographs indicate that Gionfriddo caught the ball a couple of steps from the bullpen gate and his momentum carried him to the gate. His arm was up and it appeared he’d snagged the ball as it was going out of the field of play. Whether it was going out or going to be a double (or triple) two runs, at least, were going to score. The catch ended the inning. Nearing second when the catch was made, DiMaggio kicked the dirt in a show of emotion, something no one could remember seeing him show in 11 years of baseball. The Yanks loaded the bases in the seventh, but Hatten got out of it. After an easy eighth, he needed three outs to send the Series to game seven. He got none. A single and a walk brought in Brooklyn relief ace Hugh Casey. He got an out, then a single loaded the bases. A ground out force brought in a Yankees run, but a tapper back to the mound ended both the threat and the game. It was a good game, made famous by Gionfriddo’s great catch, still one of the most famous of all World Series fielding plays, and by DiMaggio’s reaction to the grab. It would be Gionfriddo’s last big league game. It tied the Series 3-3. Game 7 would decide the champion. Game 7 of the 1947 World Series was played 6 October in Yankee Stadium. Spec Shea started his third game for the Yanks, while Hal Gregg took the mound for Brooklyn. The Dodgers struck first, picking up two runs in the top of the second. With one out, Gene Hermanski tripled and a Bruce Edwards single brought him home. A single by Carl Furillo pushed Edwards to second and took Shea out of the game. He was replaced by game four’s hard luck loser Bill Bevens. He gave up a double to Spider Jorgensen that scored Edwards, but then got out of the inning without further damage. New York got one back in the bottom of the second on twin walks and a Phil Rizzuto single. In the fourth a walk, a single, and a Bobby Brown pinch hit double tied the game, and sent Gregg to the clubhouse. Then a Tommy Henrich single off reliever Hank Behrman, scored Rizzuto with the go ahead run. Brown’s at bat had taken Bevens out of the game. In his place was relief ace Joe Page to start the fifth. He was magnificent, allowing only one hit and striking out one. Meanwhile the Yanks added a single run in the sixth on a bunt single and steal by Rizzuto followed by an RBI single. They tacked on one more in the seventh on a Billy Johnson triple and an Aaron Robinson single. By the ninth, the Dodgers were down 5-2 with their four, five, and six hitters up. Dixie Walker grounded out, Eddie Miksis singled to keep Brooklyn alive. Then Edwards grounded to Rizzuto at short. A 6-4-3 double play ended the game, the Series, and Dodgers hopes. New York was world champ by a 5-2 score. It was a terrific World Series, particularly if you liked offense. The Dodgers team ERA was 5.55 and the Yanks were at 4.09. Brooklyn walked 38 while striking out only 37. New York’s numbers were almost as bad at 30 walks and 32 strikeouts. Having said that, Spec Shea had two wins and a 2.35 ERA for the Yankees and reliever Hugh Casey had two wins and a save to go with an ERA of 0.87 for the Dodgers. For the Yankees Rizzuto scored three runs, including two in the Series clincher. Henrich had 10 hits, five RBIs, and a home run. DiMaggio’s average was only .231 but he scored four runs, drove in five, and had two home runs in six hits. Billy Johnson led both teams with eight runs scored. For the Dodgers the heroes were Jackie Robinson for simply showing up and performing well in a pressure situation (he had three runs scored and three RBIs), Casey on the mound, and Reese who hit .304 with five runs and four RBIs. Then there were the subs, Lavagetto and Gionfriddo. Lavagetto had one hit for the Series, but it won game four. Gionfriddo had a key stolen base, walked in a crucial situation, scored two runs, and made the catch of the Series, one of the most famous in World Series history. It was the second Yankees-Dodgers World Series (1941 being the first). There would be five more (and even more after the Dodgers moved to Los Angeles). The 1955 Series has become the most famous (because it’s the only one Brooklyn won), but none of them were better than 1947 in either drama or intensity. With war raging in Europe in 1915, I’m detecting a dose of nostalgia in the press. I’m not certain how much the two are related, but there is a distinct fondness for looking back on the last several years as a good time in the USA. That includes sports and allows me to stretch my inductees back a little farther than I’ve done in the last few classes. Here’s My Little Hall of Fame’s class of 1915. Outfielder Paul Hines was a member of three pennant winners, including the initial National League Champion Chicago White Stockings. Later he helped lead the Providence Grays to pennants in 1879 and 1884. When he retired he was third in Major League history in hits. He led the National League in home runs and in hits once each, and in doubles three times. Joseph Kelley was the captain of National League pennant winning teams in both Baltimore and Brooklyn. He hit .317 for his career while finishing above .300 for 11 consecutive seasons, four times topping .360. In 1896 he stole 87 bases to lead the league. 1. Kelley was one of those players who seemed to fit in nicely with the 1915 era view of what made a great player. He had lots of hits, scored a bunch of runs, had a high average (the four years of .362 to .393 were very prominent). I was surprised how often being designated “captain” of the Baltimore Orioles came up. It was seen as something of a badge of honor indicating just how important he was to what was already becoming the most famous 19th Century team. As a negative, those four years of .362 or above are 1894-1897. Those are years of huge batting averages and Kelley never finished higher than fifth in the league (1897). 2. Say, didn’t you forget something about Hines? Isn’t there something about a triple crown and a couple of batting titles? Well, yes and no. In 1915 Paul Hines was credited with neither a triple crown nor with a batting title. Hines won batting titles in 1878 and 1879. The one in 1878 contained a triple crown. The problem is that no one in 1915 knew that. 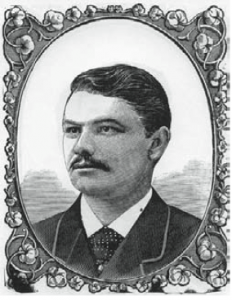 The 1878 batting title was attributed to Abner Dalrymple and the one in 1879 was given to Cap Anson. It wasn’t until the 1960s (long after all three were dead) that research established that Hines won both batting titles (it had to do with hits in tie games being counted or not counted). So for my purposes I could not call Hines either a batting champion or a triple crown winner. That made his election to a 1915 Hall of Fame somewhat problematic. But the looking back on the 19th Century that was occurring (and I’ll stress it wasn’t overwhelming in 1915–it gets worse by 1918 when the US is in World War I) meant that there was, I felt, a short window when really old-time players like Hines (his last year was 1891) might get a chance at the Hall of Fame. In Hines’ case it had to be very quick. In 1920 he got in trouble with the law (a pickpocketing charge) and in the wake of the Black Sox scandal I can’t imagine anyone with a legal problem, no matter how small, being allowed into the Hall of Fame. 3. Still shying away from George Davis are you? Yep. There’s very little information on Davis in the stuff I’ve been reading (and I’ll admit I may have been looking in the wrong places). He seems to have dropped off the radar almost entirely. His “counting stats” (my phrase for the old and standard stats that go back to 1915) are OK, but he doesn’t hit .300, never leads the league in any major category except RBIs and that stat isn’t yet an “official” stat so I don’t know how many writers knew that was true. His fielding numbers are nice, but it’s very much a hitter’s paradise at the Hall of Fame and I presume that would be true in 1915. His WAR and OPS+ are very good (heck, his OPS is damned fine for a middle infielder of the period) but those are stats that don’t exist in 1915. I’m erring on the side of caution and holding him for at least a while. 4. Next time (1916) sees Willie Keeler and Elmer Flick head a list of everyday players and Sam Leever, Rube Waddell, and Vic Willis added to the pitchers. Among contributors I’ve come across Tim Hurst who both managed and was an umpire (something of a unique combination) and George Rawlings who gets credit for inventing the baseball glove. I think I want to look at Hurst fairly carefully because the combination of talents may give me a chance to finally figure out how to deal with an umpire (but don’t hold your breath). With Rawlings I’m fairly sure he’ll be gone as soon as he arrives. There’s too much debate about who invented the glove and when they did so to accept the story that Rawlings alone did it. The nostalgia, myth era is nice, but I’m trying to keep it to things that were provable in 1916 (yeah, I know, lottsa luck). After sweeping Brooklyn in the Bronx, the New York Yankees stood poised to take the 1947 World Series handily. They would have three games in Ebbets Field and if they could win two, the Series was theirs. For Brooklyn, they had to win at least two to send the Series back to the Bronx. The fans ended up getting three interesting games. Game 3 was played on 2 October. The Dodgers sent Joe Hatten to the mound to stop the Yanks. New York countered with old-timer Bobo Newsom, aged 39 and seven years from his game 7 loss in 1940. Neither man got through the fifth inning as the game turned into a slugfest. Newsom was the first to go. The Dodgers got to him for six runs in the bottom of the second. With one out, a walk, a double, and a single plated two runs. Another out, and a single put men on second and third. A two-run double by Eddie Stanky made the score 4-0 and sent Newsom to the showers. Vic Raschi, of 1950s fame, replaced him. He watched Jackie Robinson single, then another two run double, this one by Carl Furillo, made the score 6-0. Finally a Dixie Walker ground out stopped the bleeding. The Yankees responded with two in the third, but Brooklyn got one of those back in the bottom of the inning. In the fourth New York got two on a walk, a Sherm Lollar double, and a Snuffy Stirnweiss single. Not to be outdone, the Dodgers got both back in he bottom of the fourth on a pair of walks and two singles. By now it was 9-4. The fifth saw a walk and a Joe DiMaggio home run narrow the score to 9-6. It also sent Hatten out of the game, replaced by Dodgers ace Ralph Branca. Branca finished the inning, but gave up a run on a Tommy Henrich double in the sixth and then a Yogi Berra home run made it 9-8 in the seventh. It was the first ever pinch hit home run in World Series history, and it sent Branca to the clubhouse and brought in Brooklyn’s bullpen ace big Hugh Casey. To this point, Casey was most famous for a 1941 pitch mix up with two out in the bottom of the ninth in game four of the World Series that let the Yankees win the game. He got redemption in 1947. He went 2.2 innings, gave up one run, one walk, and struck out one, and allowed only one other runner as far as second. The Dodgers won 9-8 to close the Series to a one game Yankees advantage. Both teams had 13 hits. Fans wondered if the next game would also be a hammering match. There was never a World Series game quite like game four. It became one of the most famous of all World Series games. In it, a journeyman almost did the impossible and the Dodgers bench stepped up. Bill Bevens started for New York and Harry Taylor began the game for Brooklyn. By the time the day was over they sported two of the stranger pitching lines in World Series history. Taylor faced four batters. Snuffy Stirnweiss and Tommy Henrich both singled, then Yogi Berra hit into a fielder’s choice which Dodgers shortstop PeeWee Reese dropped to load the bases. A walk to Joe DiMaggio brought in the first run and sent Taylor to the showers. He’d faced four men, given up two hits, a walk, got no one out, and given up an unearned run. Hal Gregg replaced him and got out of the inning with a pop to short and a double play grounder. Bevens then went to work. He was wild, but he was effective. Over the first four innings he issued four walks and struck out three. He left men on base in every inning but the fourth. Meanwhile his teammates tacked on another run with a Billy Johnson triple and a Johnny Lindell double. With the score 2-0, Bevens went into the fifth with a no-hitter still going. He walked Spider Jorgensen and pitcher Gregg. A bunt sent Jorgensen to third and a grounder to shortstop Phil Rizzuto got a second out, but allowed Jorgensen to score without benefit of a hit. The score stood 2-1 and the Dodgers still didn’t have a hit. Bevens walked one more man in both the sixth and seventh, but no Brooklyn player picked up a hit or scored. By the bottom of the ninth the Yankees were still ahead 2-1 and Bevens pitching line stood at 8 innings pitched, 8 walks, 5 strikeouts, 1 run allowed, and 0 hits allowed. It wasn’t pretty, but it was three outs from the first no-hitter in the World Series. A fly recorded the first out, then Carl Furillo walked. A foul provided the second out. At this point, Dodgers manager Burt Shotten, sent speedy outfielder Al Gionfriddo in to run for Furillo. Gionfriddo immediately stole second, leaving first open. The Brooklyn pinch hitter, Pete Reiser was walked intentionally. No one was quite sure why. There were two outs and Reiser had a bad leg. Anything that stayed in the park was likely to result in an out. With Reiser unable to run, Shotten sent another speedy player, Eddie Miksis, to replace him at first, then called on pinch hitter Cookie Lavagetto. He was a backup third baseman who’d gotten into 41 games that year and hit .261 with three homers and a double. So far he was 0-2 in the Series. He turned on a Bevens pitch and drove it high against the right field wall (it missed the “Hit Sign, Win Suit” sign) and bounced back toward the infield. Gionfriddo and Miksis were, with two out, off with the crack of the bat. Gionfriddo scored to tie the game and Miksis easily beat the throw to plate the winning run. Lavagetto stopped that second with his second double all year. Bevens had given up one hit and lost. Taylor hadn’t gotten anyone out and had not taken a loss. It was a strange pair of pitching lines in one of the more memorable World Series games ever played. As importantly, the Series was now tied at two games apiece. There was no way game five was going to match the drama of game four, but for intensity, it was close. The Dodgers sent 22-year-old Rex Barney to the mound. New York countered with game one starter Spec Shea. In the first, Barney got out of a bases loaded jam, then put two on in both the second and third but no Yankees scored. Shea, on the other hand, was perfect through three. In the fourth Barney, with two outs, walked both Aaron Robinson and Phil Rizzuto, bringing up Shea. The Yankees pitcher singled to left to bring home Robinson with the game’s first run. Another walk loaded the bases, but a grounder to second ended the threat. Brooklyn finally got a base runner when Shea walked PeeWee Reese. A pop to first and a grounder kept Reese at first. In the fifth, with one out, Joe DiMaggio hit a home run to deep left field to make the score 2-0. Following a second out and a walk, Joe Hatten replaced Barney on the mound. The score remained 2-0 until the bottom of the sixth, when Al Gionfriddo, pinch-hitting for Hatten, coaxed a walk, went to second on another walk, then scored on Jackie Robinson’s single. With the score 2-1, Shea got into a bit of trouble in the seventh, but pitched out of it. By the bottom of the ninth he’d walked five, struck out six, and given up three hits. Dodgers catcher Bruce Edwards led off the ninth with a single, went to second on a bunt, and stayed there after a fly failed to advance him. Brooklyn then sent up yesterday’s hero, Cookie Lavagetto to pinch hit. Shea struck him out to end the game. With New York up 3 games to 2, the Series shifted back to the Bronx for game six and an if necessary game seven. The Yanks had to play .500 ball to win, the Dodgers had to win both. Like game 4, game 6 became a classic. The 1947 World Series began 30 September in the Bronx. As with the current set up the Yanks would get two home games, then there would be three games in Brooklyn followed by a final two back in the Bronx if the Series went the full seven games. Unlike the modern Series, the games took place on seven consecutive days rather than a travel day between location changes. For game one New York manager Bucky Harris sent Spec Shea to the mound. Shea, unlike ace Allie Reynolds, had postseason experience. Brooklyn manager Burt Shotten countered with ace Ralph Branca. The Dodgers struck in the very first inning. With one out Jackie Robinson walked and stole second. He was out attempting to advance on a Pete Reiser tapper back to the mound. Reiser took second on the out and scored on a Dixie Walker single. Over the first four innings Branca was perfect, striking out five. Then in the bottom of the fifth, the Yankees pounced. A single, a walk, and a hit batsman loaded the bases, bringing up outfielder Johnny Lindell. who doubled scoring two and putting runners on second and third. After another walk to reload the bases, Branca was replaced by Hank Behrman, who promptly walked in the third run. An out later a Tommy Henrich single scored two more to make the total five runs in one inning. With the Yanks now ahead, Harris brought in his ace reliever Joe Page. Page was sloppy but effective. He gave up two runs, one on a wild pitch, but managed to hang on to give New York a 5-3 victory and a 1 game lead in the Series. Game two was the following day, 1 October. This time the Yanks sent Reynolds to the mound. Brooklyn countered with Vic Lombardi. It became the Series’ only blowout. The Yanks got a run in the first on two singles and a double play and poured it on from there. The Dodgers managed runs in the third and fourth, including a Dixie Walker home run, but New York answered each with a run of their own, including a pair of triples. Already ahead 3-2 the Yankees scored two runs in the fifth, one in the sixth, and four in the seventh to open up a 10-2 lead. It was a team effort. Every Yankees starter except eight hitter Yogi Berra had a hit (and he scored a run). Seven players (all except Berra and Joe DiMaggio) had at least one RBI. Snuffy Stirnweiss, Johnny Lindell, and Billy Johnson each had a triple and Tommy Heinrich had the only New York home run. With one out and two on the Dodgers managed a final run in the ninth by scoring on a force at second to provide a final score of 10-3. By the end of game two the Yankees were in firm control of the Series. Up two games to none, they were now moving to Brooklyn for the next two games and the, if necessary game five. At this point it had all the makings of a truly one-sided Series. There was less disarray among the 1947 New York Yankees than there was with Brooklyn, but it was in some turmoil because it was a team in transition. Between 1921 and 1943 New York had never gone more than three seasons without a pennant. By failing to win in 1944, 1945, and 1946, they’d just matched that record. The idea of going four in a row was anathema. So it brought on changes within the team. The most noticeable change, in many ways, was the man in charge in the dugout. After 16 years as manager, Joe McCarthy was gone. A combination of losing, poor teams during the war, his drinking, and new management had sent McCarthy and his seven world championships into retirement. In his place was rookie manager Bucky Harris. Now Harris was a rookie manager only in the sense of being new to the Yanks. He’d managed the Senators as far back as their single World Series title in 1924 and had spent other years managing in Boston, Detroit, and Philadelphia. On the hot seat after replacing the manager with the most championships ever and leading a team used to winning, Harris was able to provide stability to his team. The infield was changed from the glory years. George McQuinn was at first after playing the same position for the Browns and Athletics. He hit over .300 and his 13 home runs tied for third on the team. Snuffy Stirnweiss had been around for a while. He’d taken over at second during the war years and was terrific. He’d picked up a batting title in 1945. Then reality set in. The major players were back from the war; the dominant pitchers were back on the mound. Stirnweiss suffered against them. His WAR (BBREF version) went from the mid-eights to the mid-threes. It was still better than backup Lonny Frey, seven years removed from his term with the world championship Reds of 1940. He’d come to New York in mid-season and hit .179. 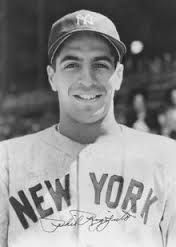 Phil Rizzuto hit .273, led the team in stolen bases, and was one of the better shortstops of the era. The primary third baseman was Billy Johnson. He had 10 home runs, had an ERA+ of 114 and was being challenged by Bobby Brown (who would later be President of the American League). The outfield saw more stability. Johnny Lindell was now the regular in left field. He hit .275 with 11 home runs. He was the replacement for Charlie Keller. Keller was having back problems and so only saw action in 45 games. He only hit .238 but tied for third on the team with 13 home runs. His .550 slugging percentage and .954 OPS led the Yanks. Right field remained with Tommy Henrich. He led the team with 98 RBIs, and with 109 runs scored. His 158 hits was second on the team as were his 16 homers. And of course he was second in both to Joe DiMaggio. 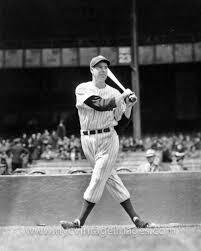 The Yankee Clipper hit .315, had 20 home runs, 97 RBIs, 168 hits, walked 64 times then had 31 doubles and 32 strikeouts. Just a more or less normal DiMaggio year. No where was in greater transition than the catching job. Aaron Robinson began the year as the primary catcher. He was 32, hit .270, was a decent catcher, and by the end of the year was losing his job to second year man, the 22-year-old Yogi Berra. 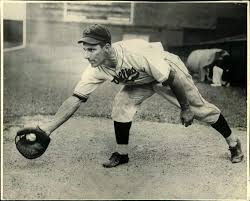 Berra hit .280, had 11 home runs, 54 RBIs, and 41 runs scored in 293 at bats. His catching numbers were on par with Robinson’s and in some cases (passed balls and caught stealing percentage) slightly better. The third catcher was Ralph Houk. He didn’t play much in 1947, but he would later manage the Yanks to three pennants and two World Series championships. Future All Star Sherm Lollar got into 11 games behind the plate. But easily the most notable transition was in the pitching staff. Gone were the stalwarts of the 1930s and early 1940s, Lefty Gomez and Red Ruffing. Allie Reynolds was now the ace. He came over from Cleveland at the beginning of 1947,went 19-8 and posted an ERA+ of 110. He walked 123 while striking out 129 and gave up more hits than he had innings pitched. Vic Raschi was only 7-2 in his rookie year (he’d pitched two games the year before), but was already 28. He would join Reynolds as one of the mainstays of the early 1950s Yanks. Spec Shea was the second pitcher. He went 14-5 and had both 89 walks and 89 strikeouts. Bill Bevens, like Shea, had the same number of walks as strikeouts. In his case 77 of each. He was a journeyman who went 7-13 during the regular season, but would make the most of his one starting opportunity in World Series play. Spud Chandler and Bobo Newsom, both aged 39, rounded out the starters. Fireman Joe Page was the primary reliever, garnering 17 saves, while relieving in 44 of 56 games. Karl Drews started 10 games and pitched in 30. No one else appeared in more than 25 games. 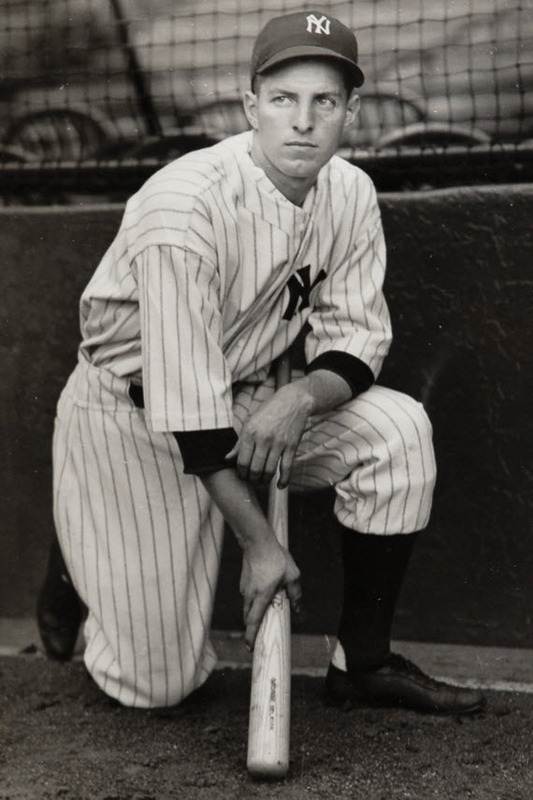 Tommy Byrne, who would come to fame on the 1950s Yanks got into four games. Except for Page (and Byrne) all of them were right-handed. They were a formidable team and favored in the Series. Since 1927 they’d won nine World Series and lost only one. In 1941 they’d beaten the Dodgers in five games. Most writers expected them to do so again, although it might take more than five games. The 1947 World Series holds a unique place in baseball history. First, it was a heck of a Series, known for two famous games and two equally famous moments in those games. But most importantly, it was the first ever postseason series of any kind that featured an integrated team. In 1947, the Brooklyn Dodgers were a team in turmoil. Leo Durocher, their manager for years was banned from baseball, a black man was on the team, a number of players were opposed to having him around, another group was at best ambivalent. The man who was to hold this all together was Burt Shotten. He’d been an outfielder back in the 1920s, then did a little managing and coaching before becoming a Brooklyn scout in 1946. With Durocher sidelined, Shotten got the call to replace him (He arrived three games into the season so Clyde Sukforth managed the first two games). He was considered easy-going and easy to get along with, just what the Dodgers needed in a volatile atmosphere. The Dodgers had finished third in 1945 and second in 1946, both under Durocher. So it’s not like they came out of nowhere to win the 1947 National League pennant, but Shotten got a lot of credit for keeping the lid on in the clubhouse. Most of the turmoil surrounded the first baseman, rookie Jackie Robinson. As the first black man to play in the Major Leagues since 1884 (Moses Fleetwood Walker), Robinson was the center of the great integration experiment of 1947. He played well, despite all the turmoil. His triple slash line was .297/.383/.427/.810 with an OPS+ of 112. He tied for the team lead in home runs with 12. His 115 runs, 125 hits, and 29 stolen bases led the team. His BBREF version of WAR was 3.1. All that got him the first ever Rookie of the Year Award (there was only one that year, not one for each league). Shortstop PeeWee Reese was even better. He’d weathered the racial problems on the team to post a triple slash line of .284/.414/ 426/.841 for an OPS+ of 121. His WAR was 6.2, tops among hitters. He’d tied Robinson for the team lead in homers, led the team in walks with 104. The other two members of the infield were second baseman Eddie Stanky and third baseman Spider Jorgensen. Stanky was one of more vocal opponents of employing Robinson, but later became famous for his confrontation of the Phillies when they were attacking Robinson during a game. He hit .253, scored 97 runs, and walked 103 times. Jorgensen, who’d been a minor league teammate of Robinson, hit .274 and was second on the team with 29 doubles. 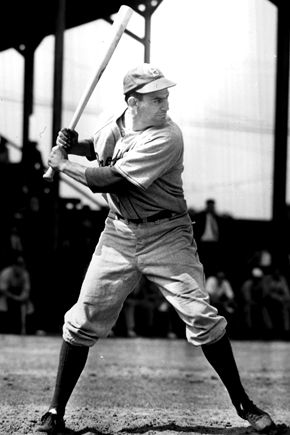 The center of the opposition to Robinson was with outfielder Dixie Walker. Walker demanded either a trade or Robinson’s demotion to the minors. He got neither. It didn’t carry over onto the field. He hit .306 with a team leading 94 RBIs and an OPS+ of 121. Right fielder Carl Furillo was famous for his rifle arm and hit .295 with 88 RBIs. The normal center fielder was Pete Reiser. Today he’s known for running into walls and otherwise being hurt. In 1947 he was hurt again, but managed 110 games, a .309 average, and 14 stolen bases. The catcher was Bruce Edwards. He was a better catcher than he’s usually given credit for by both fans and historians. His problem was that he wasn’t Roy Campanella who would, within a year or two would completely overshadow Edwards. One of the backups was Bobby Bragan. He’d initially supported Walker’s position on having Robinson on the team, but by the end of the season was one of Robinson’s strongest friends and supporters. The other backup was Gil Hodges who’d not yet moved to first base and become a Dodgers stalwart. The Dodgers had a deep bench, with seven players appearing in more than 30 games. 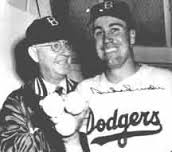 The big name for later Dodgers history was Duke Snider, a 20-year-old rookie who wouldn’t play in the Series. For the current team, the more important names were Gene Hermanski, who’d done a lot of the replacement work when Reiser was hurt, and Cookie Lavagetto, Al Gionfriddo, and Eddie Miksis who would become household names in Brooklyn by the end of the Series. The pitching staff was in transition. The big names of the early 1940s, Whit Wyatt and Kirby Higbe were both gone, Higbe to Pittsburgh as a way to curtail his influence among the anti-Robinson faction in the locker room. Hugh Casey was still around. 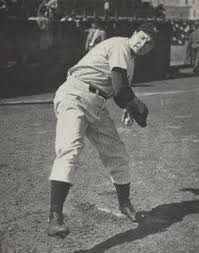 He’d thrown the most famous pitch in the 1941 World Series and was still the main Brooklyn pitcher out of the bullpen. He had 18 saves, an ERA+ of 103, but he gave up 23 runs in 29.2 innings. The great names of the 1950s, Don Newcombe, Carl Erskine, Preacher Roe, weren’t yet in Brooklyn. Ralph Branca was. He’d had a terrific year going 21-12 with an ERA of 2.67 (ERA+ 154), a 1.246 WHIP, and a 6.9 WAR. The other starters were lefties Joe Hatten and Vic Lombardi. Both had more innings pitched than hits allowed, but Hatten gave up a lot more walks than strikeouts (105 to 76). The other right handers were Hal Gregg, who started 16 of 37 games and had an ERA of 5.87, and Harry Taylor who would put up one of the strangest pitching lines in World Series history while participating in one of the most famous of all World Series games. Clyde King, Rex Barney, and Hank Behrman, all right handers, were the other pitchers with more than three starts. The bullpen, other than Casey, relied on a combination of pitchers who doubled as spot starters (Barney, Gregg, etc.) and relievers none of whom pitched more than six games (except Ed Chandler who’d been in 15 games). The most notable was Dan Bankhead, the second black player to join the Dodgers. His ERA was over seven. It was, all in all, a good team. It was short power and beyond Branca the staff wasn’t very strong, but it hit well, ran well, was a good fielding team for the era, and the darling of Brooklyn. It would draw crosstown rival the New York Yankees in the Series. Over the last several years one of the more common refrains of baseball is how much the fans in both Chicago and Boston suffered. It dropped off some when the Red Sox won in 2004 (and twice since), but you still hear it about Chicago, despite the White Sox win (primarily because it was the ChiSox, not the Cubs who won). But before you get all sad and start crying over the plight of the two cities, let me tell you about another city with the same kind of problem: Philadelphia. Philadelphia was an early hot spot for baseball. The 1850s and 1860s saw the local team, called the Athletics, being competitive. Off and on through the 1870s and early 1880s teams from Philadelphia wandered through the ranks of Major League teams, with the American Association version actually winning a pennant. In 1883 the Quakers arrived in the National League and after deciding that wasn’t much of a nickname, eventually settled on Phillies as the team nickname. In 1901 the American League arrived and stuck a team in Philadelphia, naming it after the long gone Athletics. The AL team was sporadically good. They won a pennant in 1902 (there was no World Series yet), then another in 1905 (losing the second World Series). Between 1910 and 1914 they won the World Series three times (1910, ’11, and ’13) and lost it once (’14). Then they fell into a malaise that lasted deep into the 1920s. They won pennants each year from 1929 through 1931, picking up a World Series title in both 1929 and 1930. Then they fell off. They fell off so bad that they never won another pennant. By the early 1950s they were dying and eventually left Philly altogether, heading first for Kansas City, then for Oakland (where they’ve again been sporadically good–4 world titles, a couple of pennants, and a few other playoff appearances in 45 plus years). That left the Phils, who weren’t good, sporadically or otherwise. In 1901 they finished second, they got back to the first division in 1905 and hovered around fourth until 1915, when they broke through for their first ever National League pennant. They won the first game of the World Series (against Boston) with Grover Cleveland Alexander on the mound. Then they were swept out of the Series. They finished second in 1916 and 1917 then quickly went South. Between 1918 and 1948 inclusive they finished fifth twice (1929 and 1945), and fourth another time (1932). Other than that, it’s a long, long litany of sixth (four times), seventh (eight times), last place (16 times, including five in a row at one point). They had some decent players through out the era. Chuck Klein made the Hall of Fame and after a trade got into a World Series (with Chicago). Dolph Camilli won an MVP, but of course it was after the Phils traded him to Brooklyn. They were also managed by Ben Chapman who became universally infamous for his opposition to Jackie Robinson playing in the Major Leagues (He’s played by Alan Tudyk in the recent movie “42”.) All in all it was a thoroughly forgettable 20 years. In 1949 they started improving and stayed reasonably competitive through 1955. They won a pennant with the 1950 “Whiz Kids”, then were swept in four games by the Yankees, who featured a rookie pitcher named Whitey Ford who became the youngest pitcher to win a World Series game when he won game four (I didn’t check to see if he’s still they youngest winner). It was the same year that Alexander, the last Phillie pitcher to win a World Series game, died. In 1964 there was the infamous collapse when they led the NL with two weeks to play and lost. They soldiered on until 1976, when they again made a playoff (the League Championship Series) and were again swept. In 1977 they finally won another playoff game before losing the LCS to the Dodgers in four games. For what it’s worth, Gene Garber became the first Phillie pitcher to win a postseason game since 1915 (it was in relief). At the time, only two members of the 1915 team, pitchers Ben Tincup and Joe Oeschger, were still alive (Milt Stock died in 1977). In 1980 they finally won another World Series game and Bob Walk became the second Phils pitcher, the first since Alexander way back in 1915, to record a World Series win. By then, only Oeschger was still around (Tincup died in 1980, but before the Series). Then to the astonishment of the entire baseball universe, they became the last team around in 1901 to win the World Series (even the Cubs had two wins in the 20th Century). Since then, Philadelphia has joined the ranks of the sporadically good with another World Series win and three World Series loses. Philadelphia joined the National League in 1876 and was tossed out before the end of the season. A team was formed in the rival American Association and won the 1883 Association pennant. The National League returned to Philly in 1883 when Worcester folded and the rights to a new franchise were given to Philadelphia. The new team was called the Quakers and managed to finish last. It was fairly typical for the NL team in Philly. Between 1883 and 1914 they’d won absolutely nothing. That changed finally in 1915, one hundred years ago. The 1914 Phils finished sixth in an eight team league. It cost manager Red Dooin his job. Pat Moran, who’d played one game for Philadelphia in 1914 took over the job. He was 38 and a catcher. He’d not had much of a career (.235, a 78 OPS+, and a total WAR of 6.8), but he turned into a successful manager (He led the 1919 Reds to a World Series title). He ran a team that was greatly changed in 1915. The 1915 Phillie infield (first to third) consisted of Fred Luderus, Bert Neihoff, Dave Bancroft, and Bob Byrne. Luderus was a holdover from the previous year. He’d hit only .248 but was second on the team with 12 home runs. 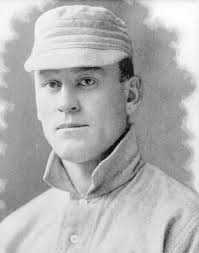 Byrne was also a holdover, although he’d been the regular second baseman in 1914. Bancroft and Neihoff were both new. Bancroft was 24 and a rookie, just beginning what became a Hall of Fame career, while Neihoff came to the Phils from Cincinnati. The outfield contained two holdovers and one new guy. The new guy was Possum Whitted. He’d been the cleanup hitter for the World Champion Boston Braves in 1914, but came to Philly in the off-season. His 43 RBIs were fourth on the team. One of the holdovers was Beals Becker. He hit only .246 in 1915, but was second on the team in home runs. The other was Gavvy Cravath. Cravath was the Philadelphia power hitter. He led the team in homers, RBIs, and runs, and was second in hits. His 24 home runs, 115 RBIs, 89 runs, and 170 OPS+ all led the NL. Bill Killefer (played by James Millican in the flick “The Winning Team”) did the bulk of the catching. He wasn’t much of a hitter, but was a good catcher. His backup, Ed Burns hit about the same but without the receiving skills. Dode Paskert and Milt Stock joined Burns as the only men on the bench who played more than 40 games. Stock led the bench with a .260 average and Paskert had three home runs. Five men did most of the pitching. The ace was Grover Cleveland Alexander (who didn’t look much like Ronald Reagan in “The Winning Team”). Alexander went 31-10, had 12 shutouts, and struck out 241 while putting up a 1.22 ERA (ERA+ of 225) and a BBREF WAR of 10.9. Erskine Mayer was the two pitcher. He was 21-15 with a 2.36 ERA. 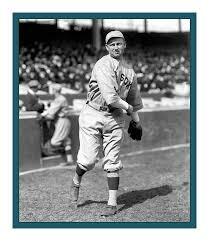 Lefty Eppa Rixey had a losing record, but still recorded an ERA+ of 115. Al Demaree and George Chalmers rounded out the starters. Southpaw Stan Baumgartner and righty Ben Tincup did most of the bullpen work, but didn’t manage to post a single save (Alexander led the team with three). The Phils won the pennant by seven games over reigning champ Boston. they were second in the league in runs, but last in hits (That’s a really odd combination, isn’t it?). They led the NL in home runs, were third in both doubles and RBIs. The staff led the league in ERA, hits, and runs, and was third in strikeouts. Individually, Cravath led the NL in offensive WAR, slugging, OBP, runs, walks, total bases, RBIs, and home runs. A caveat should be thrown in here. Almost all of Cravath’s 24 homers came at home in the small Philly ball park, Luderus finished second in hitting, second in doubles, and fifth in OBP and 10th in hits. Bancroft was third in runs scored and second in walks. Among pitchers Alexander led the NL in ERA, wins, WAR, strikeouts, shutouts, complete games, innings pitched, and just about anything else you can think of for pitchers. Mayer’s 21 wins were third in the league and he was ninth in strikeouts. He did, however, also lead the league in gopher balls. The Phillies were one hit wonders. In 1916 they dropped back to second, stayed there in 1917, then went south quickly. They would return to their normal middle of the pack to second division status for the rest of the first half of the 20th Century. Their next pennant would come in 1950, the same year Alexander died. You are currently browsing the Verdun2's Blog blog archives for April, 2015.